LOS ANGELES - Michael Jackson fans paid their respects Saturday to the late King of Pop, as his famous "Thriller" jacket went under the block, among events organized to mark the second anniversary of his death. Fans were allowed to place flowers at singer's mausoleum at the Forest Lawn Memorial Park just outside Los Angeles, where he died from an overdose of powerful sedative propofol on June 25, 2009, aged 50. "He just wanted to make the world a better place, and now that he's gone, that lives on through the fans who love him," fan Linda Higgins told the local KABC television station. "We're carrying that message and his mission through us," she added outside the mausoleum in Glendale, where Jackson's close friend Elizabeth Taylor was laid to rest near to him in March. Two years after Michael Jackson's shock death, the mystery over exactly how he died continues to fuel legal wrangling, conspiracy theories and family strains. His personal doctor Conrad Murray is still awaiting trial on manslaughter charges for allegedly giving Jackson an overdose of powerful sedative propofol to help him sleep on the fateful morning at his Beverly Hills mansion. Days ahead of the second anniversary of his death, Jackson's sister La Toya published a new book reiterating her claim that he could have been murdered, and had voiced fears to her that he would be for financial reasons. "I truly feel Dr. Murray was simply the fall guy. I think it's too easy to blame him. I think the investigation needs to go a bit further than just stopping at Dr. Murray," she said ahead of the book's publication this week. 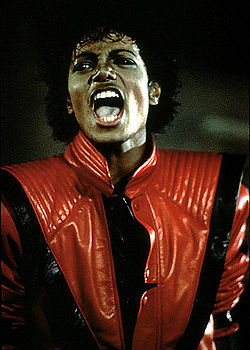 On Saturday the famous red and black leather jacket worn by Jackson in the iconic "Thriller" video was going under the block. Auctioneer Darren Julien calls the jacket "the most recognized and significant piece of pop culture" on sale at a two-day Music Icons sale, and said he expected it to fetch at least $200,000. Elsewhere, Jermaine Jackson sang a tribute to his late brother, on the eve of Saturday's anniversary, on the sidelines of the 2011 International Indian Film Academy (IIFA) in Toronto, Canada. In Las Vegas meanwhile - where a permanent show by the Cirque du Soleil troupe is due to open - a shooting incident reported clouded a tribute by fans visiting a home where Jackson lived during a stint in the casino capital. Police rushed to the scene when gunshots were heard from a few houses away - although initial reports that the victim was a dog, shot by a police officer after it attacked him, according to the TMZ celebrity website.